Our 2-Day UPS Systems Training course teaches the proper and effective techniques for designing, operating, testing and maintaining UPS and emergency power systems. This two-day technical course begins with a discussion of the need for UPS systems. It then covers the relative comparisons between various UPS topologies and their modes of operation. The batteries used for UPS systems are covered next. How a battery works, their maintenance, safety and testing is thoroughly discussed. A solid working knowledge of the typical electrical components found within a UPS is developed before exploring how AC is converted to DC and then inverting DC back to AC. 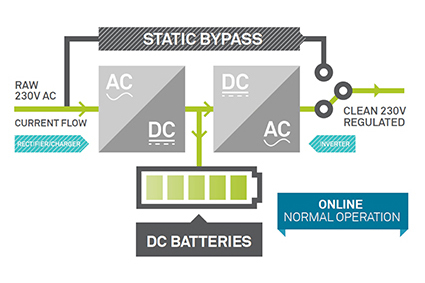 When all of the above elements of a UPS are understood, a theoretical rectifier and inverter feedback loop are thoroughly discussed. This will be followed by a troubleshooting exercise. Students are given failure scenarios where they work in groups to find which circuit component has opened, shorted or significantly changed in value to produce the alarm condition described. The course finishes with a general discussion on UPS system troubleshooting.